Innu visiting the old camp at Ushkan-shipiss where the last kushapatshikan (shaking tent ceremony) was held in November 1969. This website is all about Innu place names in Labrador. People from every culture all over the world give names to the lakes, rivers, mountains and other places on their lands. These names are called "place names" or "toponyms," and they record a culture's history on the land. "Goose Bay" is a place name as is "St. John's," "Karachi," "Beijing," "Montréal," "Paris," and "Winnipeg." For Aboriginal people, place names often give information about places that are good for hunting or fishing, or they describe the land in some way that helps people when they are travelling. An example from the Labrador Innu is Kukamessat kataht, meaning ' Where There Are Lake Trout’. Giving people directions about where to go on the land is made much easier by using place names. Imagine trying to tell people how to drive from Sheshatshiu in Labrador to Montréal if you couldn't use the place names along the highway in giving directions. Most importantly, place names are used when telling stories about people's experiences on the land. Place names are windows into people's memories about the land, and for that reason, they help record their history. The names may record significant life events such as births, deaths and burial locations, where people camped, or places where canoe-making, salmon spearing, trapping, porcupine singeing, caribou hunting and other forms of land use took place. 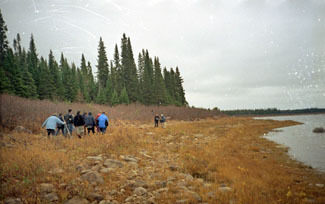 Ashtunekamiku, the Innu name for Snegamook Lake, is one example. Based on the verb ashtunu ('he or she makes a canoe'), the name refers to a canoe-building shelter. The name appears to be an old one, as it is found in the old reports by the Jesuit missionaries (the "Jesuit Relations") as Astouregamigoukh, dating to 1643-1644. Sometimes, the names record information about events that affected the environment long ago, such as forest fires, even when the traces of these events are no longer obvious to the eye. One Innu example is Kauipushkakamat, which means 'Burnt Area Lake'. Place names can give archaeologists clues to Innu life during the fur-trade period as well as before contact with Europeans, and help them find ancient sites in the territory. Some place names refer to historical and religious events. An Innu place name with great religious significance is Tshishkuetutsheunnu-minishtiku, an island named after an old shaman called Tshishkuetutsheunnu. One day, the old shaman was chased by a cannibal monster called Atshen. He managed to escape by hiding on this island and performing a shaking tent ceremony. In summary, place names are very important for a people's sense of place. We hope that by exploring this website you will learn about the Innu people's sense of place. This is the place that the Innu call Nitassinan ('Our Land') in the Quebec-Labrador peninsula. The work of collecting Labrador Innu place names goes back to the mid-1970s. It started in the context of various studies aimed at documenting Innu land use and occupancy for the purpose of land claims negotiations with the federal and provincial governments. The biggest source of place names for this website comes from a 1980 project that we call "LAMAP." Over 500 maps at 1:50,000 scale were cut and taped together to form two giant maps. One was laid on the gym floor at Peenamin McKenzie School in Sheshatshiu and the other in the parish hall in the former community of Utshimassit (Davis Inlet). Older hunters were invited to walk about on these maps to point out the locations of place names as well as old travel routes, camp sites, caches, birth places and good hunting and fishing places. The names of the people who worked on the LAMAP project are listed in the site credits. Subsequently, José Mailhot and Anne-Marie Baraby entered the place names from these maps into a large database, but most of these names needed a lot of additional work in terms of figuring out their meanings, clarifying what geographic features they referred to, and standardizing their spellings. In 1994, José Mailhot supervised another project, called "INNUTOP," to collect place names in the Sheshatshiu region that generated a good number of reliable names in terms of their spellings, meanings, and locations. Finally, in 2004, Peter Armitage, José Mailhot and Marguerite MacKenzie put together another project, called "LABTOP," to complete the Labrador Innu place names. Lack of resources prevented dealing with the entire geographic area occupied by Innu who settled at Sheshatshiu and Utshimassit, and so the area was restricted to 195 NTS maps at 1:50,000 scale covering much of Labrador east of Churchill Falls. The area covered by these maps comprises the region from the headwaters of the St. Augustin River in the southeast, to Lac Brulé in the southwest, to Michikamau Lake in the west, to the headwaters of the Fraser River in the northwest, to Nain in the northeast, and Rigolet in the east. The LABTOP project was mostly a process of validating all of the place names from the previous research projects including LAMAP and INNUTOP. To help in this validation work, a new relational database was created in 4 Dimension as well as a MAPINFO GIS database using digital 1:50,000 scale basemaps. The place names from the old databases were compared and located on computer maps, their spellings and meanings clarified and standardized whenever possible, and problematic names starred for fieldwork validation. Each place name had to be delimited in terms of its geographical extent in order to meet the requirements of the Geographical Names Board of Newfoundland and Labrador. This was done digitally using MAPINFO GIS. Problematic names from the Sheshatshiu region were validated by Peter Armitage in November 2005, while names for the Natuashish region were validated in April-May 2006. Pashin Penashue, Atuan Penashue, Napess Ashini, and Ishpashtien Piwas assisted with the validation work during which place names not previously noted were also recorded. Once the validation exercise was completed, José Mailhot continued her work on clarifying the meanings and explanations of the place names, and writing them according to the rules of the shared spelling system. With the place names validated, the LABTOP database could be readied for web publishing. This work fell to the multi-media company, Idéeclic. However, additional materials were assembled for the website including audio clips, short audio stories about people or events associated with place names, and photographs and videos taken there. Lastly, Innu youth were asked to record their own stories about place names in their territory. These complement the stories extracted from interviews with their Elders conducted in the context of various research projects. Users of this website should note that there were many names in the old databases that we could not validate because no one knew what they meant, or else we could not be sure what mountain, lake, river or marsh they label. Trying to figure out what these names mean and what they label was next to impossible because the Elders who provided them in the first place have passed away, and can no longer be consulted. Sadly, these names may be lost forever in the mists of time. A draft version of this website attempted to layer audio clips on the map of Nitassinan using Shockwave Player and DEMIS Web Map Server. However, the resultant interactive map proved to be too cumbersome. Google Map’s satellite images were used instead even though many places are obscured by cloud. Options for improved map functionality are being explored and hopefully will be incorporated into future versions of this website. Building this website has been an initiative of the Sheshatshiu Innu First Nation.